Imagine for a moment that you are able to walk into your meeting with the deep certainty that everyone in the room is well-versed in the subject matter. Because the “prep” work was good, you cut out any chance of a dual speed meetings: with half of the quorum eyeing insightfully the next steps, and the other half asking those clarifying questions – or worse still – moving off onto tangential topics. In the meeting, brainstorming is optimal as all of the core data visible is on your dashboard. The team knows that gathering multiple types and sources of data together is always more valuable than data held in isolation. Brainstorming is facilitated by a creative canvas that brings all sorts of content onto the screen – not only the word doc and excel, multiple instances of gmail, interactive helpers such as calculators or live annotating, post-it notes, a chat channel and other tools concurrently opened and simultaneously active. Your visualisation layer is an Infinite and Interactive digital Whiteboard that aggregates all types of data, multimedia and apps, and also displays the workspace adaptively on all digital surfaces and devices in the room. The full crux of the discussion is addressed collaboratively, interactively, and via greater team engagement – as opposed to flawed decisioning taken by an individual off partial context, or influenced by the latest social networking advocacy that happened before the meeting. Dissemination is instantaneous. When you finish your meeting, you press the “I’m done” button and the dashboard UI environment shares the material and the notes with all participants. Your workspace is also an efficient sharing environment offering Google Doc type of two-side collaboration functionality, live and asynchronous sharing, with the addition of merge functionality, versioning, notifications and alerts for unexpected changes. 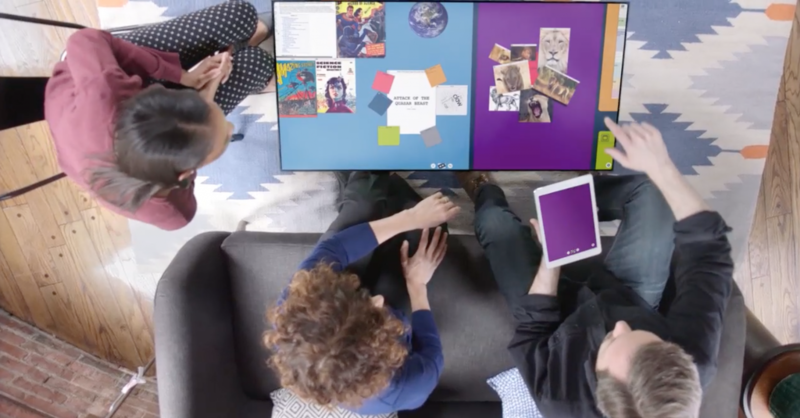 Imagine also that your creative workspace is IoT-enabled, allowing for a user experience – if it can be stated that way – of the meeting environment that is enhanced. Your workspace enables an efficient environment, controlling projectors, air con and lights at break times, shutting off the projector to save on energy consumption if no-one is in the room, or avoiding those lost 12 minutes at the start of the meeting when presenters are exchanging USB sticks, passing cables and trying to get their slides up on the projector. Imagine that all stages of the creative collaboration lifecycle, from prep to presentation, brainstorming to outcome-sharing are all much more productive.